Easter Waffles, is there a better way to start celebrating Easter? I think not! 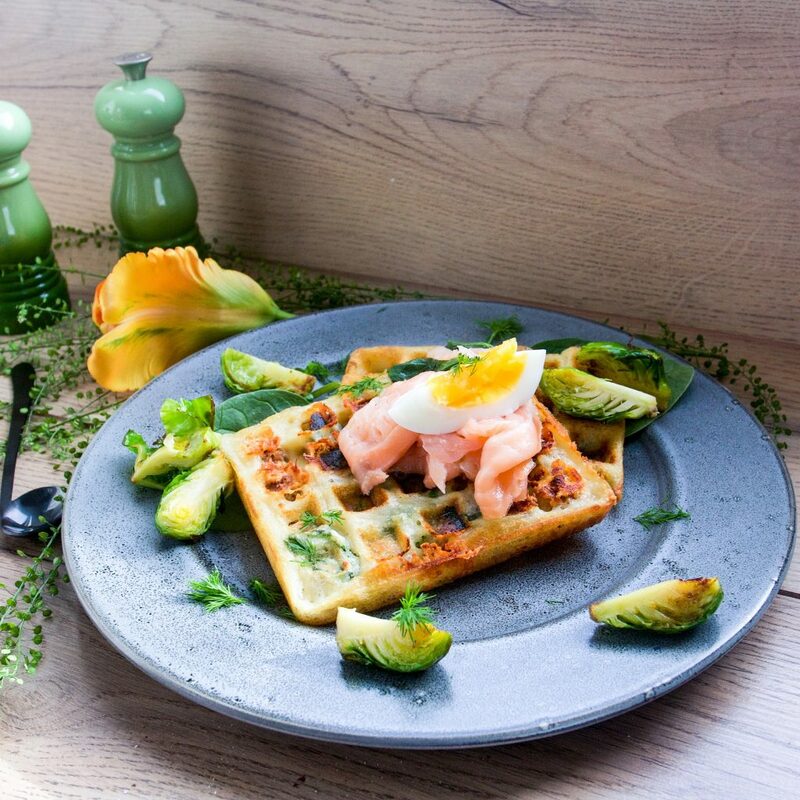 This specific recipe is an Easter waffle filled with Scandinavian flavours. And very typical toppings on the Easter dinner table. I love Easter, and I love waffles. The combination is Easter waffles. It’s a perfect way to celebrate spring and all the Scandinavian flavours in one little bite. This time of year it’s exciting to put all the freshly awoken flavours on the table. In Sweden cured Salmon is a must on any Easter table. There is also dill, eggs and West botnia cheese and brussels sprouts. Now, while the sprouts can be bitter if you fry them in some oil, it compliments the flavour of the cured salmon matured cheese. Think of this Easter waffle as a perfect taste combination of Swedish Easter traditions. Served on a perfectly crunchy waffle with greens and creamy matured cheese. There you have it, Easter waffles. 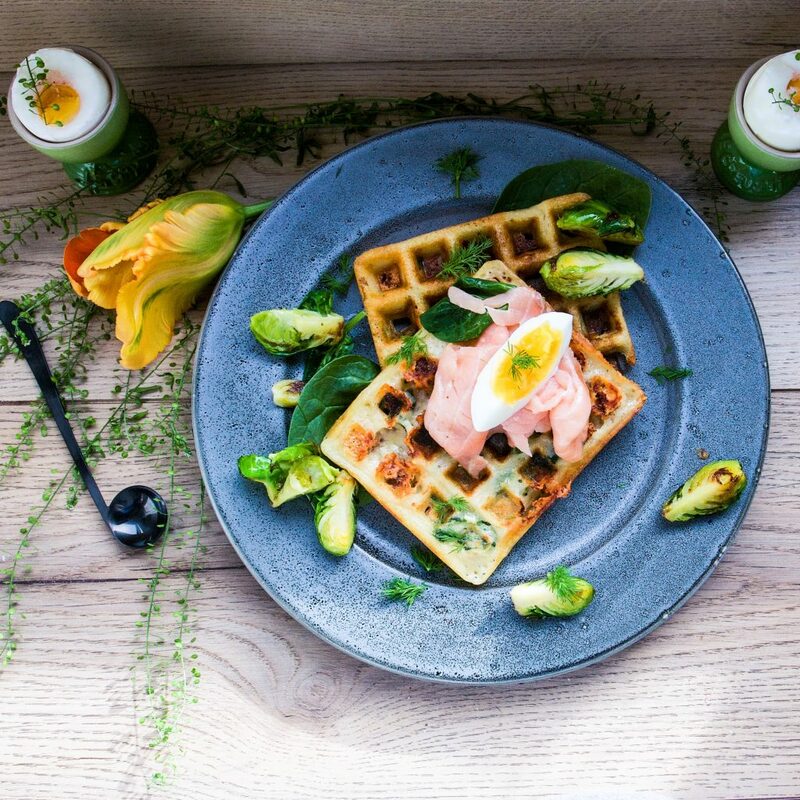 Perfectly delicious Easter waffles with traditional Scandinavian toppings. Pour in the milk and whisk until smooth, add the whipping cream and whisk some more. Lastly, mix in the oil, chopped spinach and grated cheese. 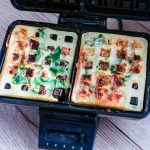 Heat the waffle iron and brush it with a little oil, so the waffles don't stick to the iron. Pour about 100 ml of batter for each waffle into the waffle iron. Fry the brussels sprouts while baking the waffles. Need some waffles for dessert? Then I have the one for you.